I bought a high-end digital video camera last year to film a documentary about twin Bengali brothers headed to Norway in search of their Nordic roots. When I started filming the parents of the brothers, a thought came to me: If I'm doing this for Bengali twins looking for their Nordic roots, maybe I should do it for my own family and, specifically, my mother and the Malaysian dishes she makes. "Oh please, don't cook that! We'll smell for days,"
When we moved to Canada in 1976, mom walked onto the plane with her blue vinyl-covered recipe book, her beloved cast-iron wok, and a large packet of Mrs. Brody's curry. These three carry-on items would sustain my bond to Malaysia in future years. Food was our cultural sustenance, our tie to the homeland. Anyone who visited us from Malaysia was required to bring a package of Mrs. Brody's blend. Mom would calculate how many dishes we could get from each packet, saving the curry for special occasions. It's a muddy yellow mélange of turmeric, cumin, ginger and Mrs. Brody's mystery spices. In our new country, mom would occasionally whip up Malaysian specialties such as the noodle-soup laksa, pandan chiffon cake, delicate and crispy kueh pie-tee shells filled with a bamboo/crab fusion, and the roll-up poppia. She would always refer to her recipe book, brimming with cut-outs from magazines, typewritten recipes from friends, hand-written instructions, and spots of grease or sauces dotting the pages. The book had personality. In my teens, I began to view Malaysian food dismissively. Sometimes I would secretly curse the pungent smells emanating from our house, saturating our clothes with exotic odours. "Oh please, don't cook that! We'll smell for days," my two sisters and I would plead with my mother whenever she decided to stir-fry vegetables with belachan - a savoury-salty shrimp paste with a smell that assaults the senses when fried up. Its odour is reminiscent of stinky socks, but does it ever make veggies taste yummy. Throughout my twenties, going to university and moving to different cities around Canada, mom would send me care packages full of hot pork jerky, gourmet Sumatran coffee or her highly cherished pineapple tarts. One bite and I was home. Now that I'm in my thirties, my yearning for Malaysian food has grown into lust. "Your eyes, always bigger than your belly," my mom often cautions me when I'm visiting her and filling my giant Chinese bowl with an ample helping of laksa - a layered noodle soup with bean sprouts, vermicelli, shrimp, shredded chicken and slivers of egg omelette drenched in the aromatic laksa broth. I am ingesting my culture. A couple of years ago, as I was visiting my parents for Christmas, mom took out a package of curry paste from a box. I couldn't believe it! What happened to Mrs. Brody's curry? I asked. "Mrs. Brody died. None of her kids bothered to learn her recipes, so her special curry mix died with her. Don't worry, I found this great packet of Malay curry in Chinatown." It did taste good and since then I have forgotten the taste of Mrs. Brody's curry. What a shame. It made me wonder whether mom's recipes could be replaced so easily - that a package would suddenly appear labelled "Mrs. Chua's Delicious Laksa Blend." Then what? I would never know about the spices, the work involved and the labour of love, just like Mrs. Brody's kids. 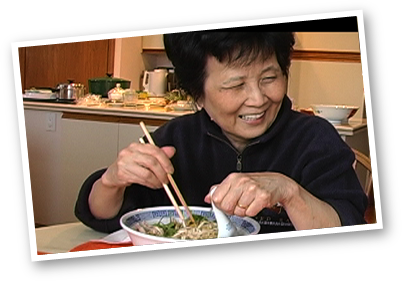 I could at least preserve my mother's cooking, so I started to film her last year while she made Malaysian recipes. It's not the recipe, really. It's watching her make it, the expression on her face, her small hands as she shreds the chicken, and her smile as she watches us devour her hard work. I have heard the American-Asian writer Amy Tan say something to the effect that Chinese mothers do not express their love in words; instead they show it in generous helpings of the food they make. Exactly 30 years ago this month, mom carried that recipe book onto the plane bound for a new life in Canada. I will be filming my mother until she is unable to cook for herself. It's my version of her blue vinyl-covered recipe book, with its torn pages and gravy stains. It is through the act of making food that my mother reveals her love. I want to capture it, bottle it, preserve it.